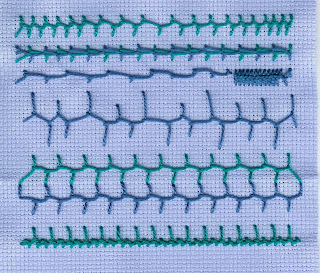 Here's my attempt at Cretan Stitch for the TAST challenge. I wasn't very inspired by this and haven't done very much with it. Maybe my technique's not right but I kept having to turn the fabric between each stitch and that was irritating. However I was surprised by the different looks achieved even in just a few rows: I liked the small section stitched very closely together and at a casual glance I wouldn't realise that either the second row or the bottom row were Cretan, the last row looks more like a variation of buttonhole. So I'm glad I had a go even though it won't be my first choice in the future.